Leading Manufacturer of dye sublimation printer and digital direct textile printer from Delhi. Backed by our experts and advanced facilities, we have successfully been able to offer a huge array of Dye Sublimation Printer. The assortment offered by us is perfectly designed with the help of quality certified inputs and technology. These products are developed under the supervision of experienced professionals. Our products are highly demanded and praised owing to its elegant design and low maintenance. Being a dominant name in this domain, we are engaged in offering high-quality Thermal Transfer Textile Printer. The offered textile printer is designed with supreme grade components of our well-equipped developing area in compliance with market norms. We provide this textile printer in different stipulations as per the requirements of patrons. 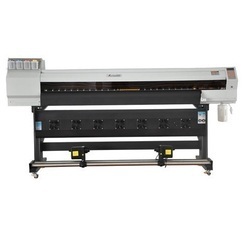 Our offered textile printer can be availed in various models at highly affordable price.